Cayenne pepper comes from red, hot chilli peppers. It is also known as the African red pepper, American red pepper, Spanish pepper, bird pepper, or Guinea pepper as it is sometimes called in the United Kingdom. It is also sometimes called by its Latin derivative capsicum. Cayenne pepper comes from the dried pods of chilli peppers and is used as a spice for culinary uses as well as alternative health purposes. The herb is named for the capital city of Cayenne in French Guiana, a country on the northern border of Brazil in South America. 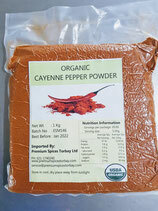 The word cayenne comes from the Tupi word "kyinha," which literally means "hot pepper." 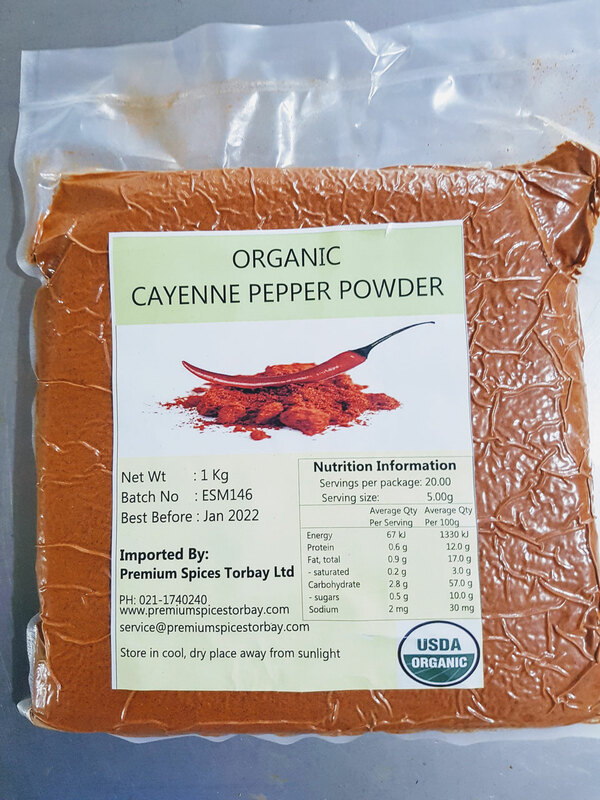 How is cayenne pepper powder made? The peppers or fruit are dried and ground, or pulped and baked into cakes, which are then finely ground and then sifted to make the powdered spice. This powdered spice is well known to cooks and chefs the world over but its true value lie in its medicinal properties. Indeed, it is one of the best-kept health secrets of the modern world. Cayenne pepper is very high in some key vitamins, namely vitamins A, the B vitamin complex, vitamin C, calcium, vitamin K, niaicin, iron, and the minerals potassium and manganese. It is highly beneficial for the heart and its high concentration of potassium is a key component of that benefit. BTW, our cayenne pepper has a heat range from 25,000 to 40,000 SHU. It is available in 100g, 500g and 1 kg.